“Remember When…” is a phrase that generates feelings of warmth and fondness within us all. As we celebrate 150 years of St. Patrick Parish, what are some of your favorite stories and memories from your time as a parishioner? Share your thoughts, anecdotes and memorable occurrences. Ideas range from sermons from former or current priests and deacons, experiences from you or your family–anything that, over the years, have led us to our 150th celebration! Memories can be submitted by clicking here, or by contacting the parish office to request an address to send your submission by mail. Remembrances will begin being published weekly in the bulletin and here on this webpage, so be sure to visit often during the Jubilee year! One of our parishioners, Clara Dunlap, made the BEST Easter bread bake sale at Easter time. During a recent conversation she mentioned that from 1984 to 1993 she baked 1059 loaves of bread for the church for Easter! Unfortunately, due to her health issues she no longer can do this, but what a contribution she made! One of the main industries in Kennett Square in the early 1900’s was milk production, including condensed milk. Chocolate and white milk were delivered in crates for lunch at school by the dairies, and the eighth grade boys would deliver milk to each classroom. All the students in the school did the Stations of the Cross every Friday in Lent. The pews in the church are solid red oak, apparently sourced from Dubuque, Iowa. They were originally installed in the church when it was built in 1908, and it took three workmen three weeks to install them. There’s no record of how much they cost then, but if similar pews could even be found now each pew would likely cost thousands of dollars. The pastor who selected the site for our current church, Fr. John O’Donel also purchased the land on which our parish cemetery is located in 1904. Before the establishment of this cemetery Catholics were buried at a churchyard at Coffee Run and at St. Patrick’s Mission Churchyard on Ashland Clinton School Rd. in Delaware. That is still marked as St. Patrick’s Cemetery. The bulletin boards in the school hallway were decorated every month. In addition to opening St. Patrick’s School Fr. Dever launched a fund-raising campaign to pay the remaining debt from the construction of the new church building. The 150 families in the parish contributed $7,740 (about $97,400 in today’s dollars) in two weeks’ time to completely settle the debt. Fred McCarthy Sr. would stand in the back of church directing children to their seats for the Children’s Mass. Fr. Austin C. Grady served as pastor for only two years (1926-1928). When he arrived in January 1926, he saw the need for a new school building. The cornerstone was laid on March 19, 1927 and the building was occupied for the first time on January 5, 1928. The total enrollment in the 1928 school year was 290 students. Catholics could not eat meat on Ash Wednesday or any Friday during the year, not just the Fridays in Lent and Advent. The only exception to that rule was when St. Patrick’s Day fell on a Friday. The archdiocese usually granted an exception so everyone could have their traditional corned beef and cabbage dinner. St. Patrick’s School was opened on September 5, 1922 while Fr. Joseph Dever was the pastor. There were 54 students (27 girls and 27 boys) in grades 1 – 8. Classes were held in the convent building (since demolished). The Sisters of St. Joseph staffed the school. Sister Mary Visitation taught grades 1 – 4 and Mother Deodata taught grades 5 – 8. The statue of the Sacred Heart, now gracing our cemetery, was donated to St. Patrick Church in 1950 in honor and remembrance of Pauline Buchiazzo, who was a member of the 1930 graduating class of St. Patrick School. The statue was originally located between the church and the rectory. The Ladies of St. Patrick began in 1964, and from their organization began the idea of volunteer groups to assist the sisters and pastor in projects to benefit the church and school. In the early years, they organized bazaars, card parties, bakes and dinners to fund activities and pay for equipment used in our school and church. They also created the Centennial Cookbook and the profits from the many printings of the book funded, the kneeler/seats at St. Gabriel, donations to the School library and other items, too many to mention. You were and still are a vital, giving organization and we thank you for your years of service. The first St. Patrick School, circa 1922, was in a two-story house next to the church, which later became the convent. The school had just one room for all eight grades. The 54 students sat in individual rows by grade. The Sisters of St. Joseph lived on the second floor of the house. While St. Patrick’s Parish was established in 1869 the priests who served our community were not permanently assigned here. Fr. James Kelley had responsibility for the parish beginning in 1874, but he was not named pastor until 1893. The first resident pastor, Fr. John O’Donel, was assigned to the parish that same year. He resided in various homes including the Grayson family home, which is now the parish office and finally in the newly built (and current) rectory. The first baptisms were held in St. Patrick’s for Anna Quinn and John Riley on October 29, 1893 and the first marriage was celebrated on November 30 of that year for David Crossan and Anna Hayes. Before the founding of St. Patrick’s as a parish a priest would travel to Kennett from St. Joseph’s on the Brandywine to say Mass in the homes of Irish families living in this area. Most of the men in those families worked in the Hagley Mills Munitions Factory, so priests from that area would minister to their families here. At that time the Diocese of Philadelphia encompassed Delaware, western New Jersey as well as a large part of Pennsylvania. Anyone receiving Communion at Mass had to fast from midnight the night before. That was one reason why many Catholics got into the habit of attending Mass early on Sunday morning. This also led to the common tradition of Communion Breakfasts sponsored by many of the parish organizations. During May of every year there was a procession of all the school children honoring the Blessed Mother. One of the 8th grade girls would be elected May Queen. She would crown the Blessed Mother in the grotto of the schoolyard. At its founding, St. Patrick’s encompassed all of southern Chester County. St. Francis Xavier Mission church was built in Landenberg at Sawmill and Landenberg Roads for those parishioners who lived too far from Kennett Square to attend Mass here. The church was small, had limited parking and no indoor plumbing even as late as the 1960’s. As the Catholic population grew the need for a new mission church became evident, and land was purchased for St. Gabriel Mission in 1965. That is the site of what is now St. Gabriel Parish. The original St. Francis Mission building still stands and houses an art gallery. Every Sunday was a family day. No stores or businesses (except maybe gas stations) were open. Stores and banks remained closed on Good Friday from Noon to 3 pm. In 1965 a Confraternity of Christian Doctrine (CCD) program was established at St. Patrick. In 1966, twelve CCD classes were held on Monday evenings for high school students, and in 1967 classes opened for grades 1 through 12 on Saturday morning. Planning began in March 1970 for the St. Patrick Country Fair under the direction of Dr. Guy Morse. The parish Men’s Club and the Ladies of St. Patrick were involved in the planning and staffing the Fair. The first Country Fair was held at the Sons of Italy from 9:00AM to 11:30PM(!) followed by a Midnight Mass at the church. In 1971 the Fair was moved to the grounds of St. Gabriel’s Chapel (which was still part of St. Patrick), where it remained until 1982. In 1977, at the age of 60, Dr. Morse left his teaching and research position at Penn’s New Bolton Center to begin studying for the priesthood at the Sacred Heart School of Theology in Wisconsin. In August 1981 he was ordained a priest at St. Patrick Cathedral in Charlotte, NC. Fr. Morse died on June 10, 2000 at the age of 83. In June 1954, The Knights of Columbus Chapter 3858 was formed. Due to the relatively small size of the parish, St. Patrick and two nearby parishes, St. Mary (now Assumption of the Blessed Virgin Mary), West Grove and Sacred Heart, Oxford comprised the chapter. “Fritz” Madonna (Deacon Jim Madonna’s uncle) of Kennett Square was the Grand Knight. On May 1, 1965 land was purchased from Louis Toto for the future St. Gabriel’s parish. Ground was broken for the new chapel on August 8, 1965. The Adult Choir of St Patrick is formed under the direction of Shirley Madonna. In 1967, a Children’s Choir was created with the children of St. Patrick and area public schools. Under the guidance of Fr. John Wall of Ivy Mills, funds are collected for the erection of a church for St. Patrick’s. On Christmas day 1869 Masses were begun in the first parish church building on South Street. That day is remembered as the beginning of St. Patrick Parish. The church building on South Street was used until the construction of the current church building in 1907. The school children would be anxious to carry the Sisters’ book bags. Among the changes mandated by the Second Vatican Council were opportunities for lay Catholics to become more involved in parish life. 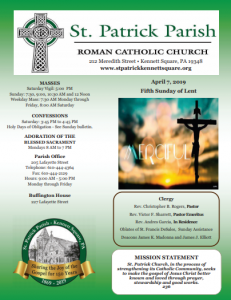 Among the new ministries at St. Patrick were the Charismatic Prayer Group (1972), Eucharistic Ministry (1979), Guitar Group (1985), Cantors (1986), Parish Council (1993). On a sadder note, the last of the teaching Sisters of St. Joseph left St. Patrick School in 1988 after having staffed the school since its establishment in 1927. At school Masses all the girls sat on the Blessed Mother’s side of the church and the boys sat on the St. Joseph side. There was an 8:30 children’s Mass every Sunday. All the children had envelopes to put into the collection basket. All women and girls had to have their heads covered in church. The girls of St. Pat’s had green beanies to wear to church. But if any of the women forgot their hats, almost anything would do – even a Kleenex held on with a bobbie pin. Under the leadership of Fr. O’Donel, ground was broken for our current parish church in 1906. The cornerstone is laid on July 21, 1907 and the church is dedicated on August 9. At the time of its construction the church was in a rural area surrounded by meadows. The first child baptized in the new church was Angelo Leo, on August 15, 1908, and the first couple married in the church were William F. Leonard and Anna V. DewIre, also in August 1908. The bride was the great aunt of one of our current parishioners, Anne Williams. The children’s choir would sing at the 6:00 Mass on Christmas morning and all of the celebrations during Holy Week and Easter. There was no adult choir at that time. The school students would sell raffle tickets for turkeys at Thanksgiving and wrapping paper for Christmas. Our current parish church dedicated in 1907 is constructed in granite with limestone trim with a bell tower at the southeast corner. It has a seating capacity of 400. The pastor, Fr. John O’Donel, selected the subjects for the stained-glass windows on either side of the sanctuary. The windows were created by the firm of F.X. Zettle of Munich, Germany. Students could walk home for lunch if they lived close enough to the school. Someone was assigned to clap the old felt blackboard erasers outside and get covered with chalk! The first priest ordained from our parish was Fr. (later Msgr.) Felix A. Losito. Felix Losito was a graduate of Kennett High School and attended St. Charles Borromeo seminary. He was ordained on May 15, 1958. After ordination he was assigned to various parishes in Berks County. He became pastor of Holy Rosary Parish in Reading, where he served for over 43 years. Msgr. Losito was widely admired for his dedication to the poor, ill and lonely people of his parish and community. He initiated a shut-in day at Holy Rosary in 1970 that encouraged people to visit a sick friend, relative, elderly neighbor or someone in prison in need of compassion and companionship. Transportation to school was by Shortline Bus, parents’ car, or on foot. Msgr. Felix Losito’s initiative at Holy Rosary was inspired by St. John XXIII’s comment when the pope visited prisoners in Rome. He said, “You could not come to see me, so I came to see you.” His idea gained wide support in the region and nationally. Pres. Nixon established the third Sunday in October as National Shut-in Day. Since 2002 National Shut-in Day has been observed on February 11 to coincide with World Day of the Sick, which was proclaimed by St. John Paul II. It would be a fitting memorial to him to visit someone in need of companionship tomorrow. Msgr. Losito died on November 3, 2011 and is buried at St. Patrick Cemetery. There was no advance notice when school was closed due to snow and the nuns stood outside to wave you on. James Wood was born in Philadelphia in 1813 of English immigrant parents. His family was Unitarian. As a young man he was sent back to England for schooling before completing his studies in Philadelphia. Then he moved with his family to Cincinnati. He worked in banking there. He converted to Catholicism in 1836 and entered the seminary in 1837. He studied for the priesthood mainly in Rome, where he was ordained in 1844. He then returned to Cincinnati, where he served as a curate at St. Peter in Chains Cathedral. His first assignment as pastor was at St. Patrick’s church in Cincinnati in 1854. The parish took up a “fuel” collection in June, 1953. The church bulletin was published only once a month during that year as well. Fr. James Wood was named auxiliary bishop of Philadelphia in 1857 under Bishop (St.) John Neumann. He succeeded Bishop Neumann as Bishop of Philadelphia in 1860. In 1868 the dioceses of Harrisburg, Scranton and Wilmington were established from the existing Philadelphia diocese. At that time there were about 125,000 Catholics in Philadelphia, served by 157 priests in 93 parishes. Bishop James F. Wood dedicated St. Patrick’s Church on September 1, 1872. Philadelphia was elevated to an archdiocese in 1875 and Bishop Wood became the first archbishop of Philadelphia. At the time of his death in 1883 there were more than 300,000 Catholics in Philadelphia served by 260 priests (plus 99 seminarians) in 127 parishes. School students took piano lessons from one of the sisters in the convent. In 1869 the following events occurred: The first transcontinental railroad was completed on May 10. The Cincinnati Red Stockings played the first professional baseball game on June 1. Rutgers defeated Princeton 6 – 4 in the first intercollegiate American football game. The Suez Canal opened on November 17. The First Vatican Council convened on December 8. Women won the right to vote for the first time in North America in the Wyoming territory on December 10. Dmitri Mendeleev created the periodic table and Leo Tolstoy published War and Peace. Father Dennis gave his famous sermon about A & P (Ashes and Palms) Catholics. The subjects of the stained glass windows in the church were chosen by the pastor in 1907, Fr. John O’Donel. The windows depict on Mary’s side, from front to back, The Blessed Virgin Mary with the Child Jesus (in memory of Mr. & Mrs. Felix Slavin), St. Patrick (donated by Mr. & Mrs. William O’Neill), St. Agnes (in memory of Margaret Cunch), St. Matthew (in memory of Gerald McCarthy) and St. Luke the Evangelist (donated by Reverend Father Hugo). The 4th and 5th grade classes were together in the downstairs classroom. When St. Patrick School opened when Dennis Cardinal Dougherty was the archbishop of Philadelphia. He was born in 1865 in Ashland, Pennsylvania, the sixth of ten children of Irish immigrants from County Mayo. He attended the public elementary school until he was ten. He graduated high school at 14, and passed the entrance exam for St. Charles Borromeo Seminary, but he was too young to enter the seminary. His parents sent him to a school in Montreal, where he studied for two years. Upon returning to Philadelphia at age 16 he did enter the seminary, and skipped the first two years of preparation there.